Blues guitarist, singer and songwriter Earl King, a native of New Orleans, was one of the coterie of influential artists who helped create the distinctive style of R&B which characterised the music of the Crescent City, and which, along with the work of other New Orleans artists like Fats Domino and Allen Toussaint provided one of the musical bedrocks for the soul and R&B boom of the ‘60s. 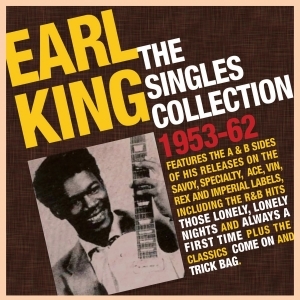 This 41-track 2-CD comprises the A and B sides of just about all of his releases as a solo artist during this first decade of his career, from his debut for the Savoy label in 1953, and including his subsequent releases during this era on the Specialty, Ace, Vin, Rex and Imperial imprints through to 1962, after which there was a hiatus in his recording activities until later in the 60s. It includes his R&B hits “Those Lonely, Lonely Nights” and “Always a First Time”, and his classic and much-covered songs “Come On” and “Trick Bag” – “Come On” was later recorded by Jimi Hendrix on his “Electric Ladyland” album, and other songs of his were covered by the likes of Lee Dorsey, Robert Palmer, The Neville Brothers and Dr. John. This anthology represents a thorough overview of his output during this time, and is a highly entertaining showcase for his distinctive brand of up-front New Orleans R&B.